India has reiterated its commitment to work with the international community to find practical, pragmatic and equitable solutions to climate change. 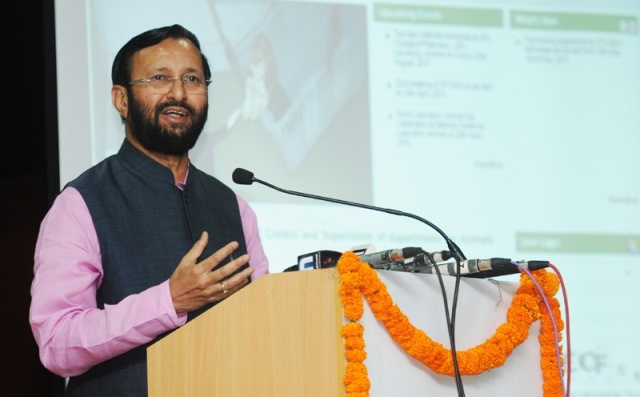 Making an Intervention at the Petersberg Climate Dialogue in Berlin recently, Environment Minister Prakash Javadekar noted that every Climate Action has a cost and the world must think as to who would pay the cost and reiterated the Polluter Pays principle. “I strongly feel that the most important and cross-cutting issues for the 2015 Agreement are of differentiation and provision of finance. The principle of equity and Common But Differentiated Responsibility (CBDR) must encompass all aspects of the 2015 agreement. At the outset, I want to assure all that India will continue to play a constructive, proactive and responsible role in the international negotiations and will work with the international community to find practical, pragmatic and equitable solutions to the climate change problem. This is not out of any external pressure, but the pressure is of climate change and that of aspirations of future generations. The international community must incorporate the concerns of developing countries in terms of their need for development and meeting their basic national priorities. This has already been accepted in Lima and we must incentivise the Parties specially the poor states to enable ambitious action on their part. The immediate action is finalising the draft decision text for Pre-2020 actions by the developed countries in the Bonn session in June 2015. In the context of finance, we have already discussed and mentioned the quick operationalization of the Green Climate Fund (GCF) and provisions of support for adaptation activities and technology transfers as important milestones in this process. The Copenhagen decision 2/CP.15 clearly mentions “SCALED UP NEW AND ADDITIONAL, ADEQUATE AND PREDICTABLE” funding to be provided to developing countries. There needs to be predictability sooner than later. As countries are preparing their INDCs, they must know the quantum of international financial assistance. India is already taking its own actions. A huge amount of public and private funds are involved. But we are putting across this issue in the interest of the developing world. As there are no free lunches, there won’t be free speeches either, if finance is not committed. Obviously, Official Development Assistance (ODA, pegged at 0.7 % of the GDP of developed countries) which were already committed, cannot be termed as new and additional. Secondly, on the sources of fund – of course, it can be from a variety of sources, but the goal agreed to was $ 100 billion per year by 2020. The fact of the matter is that we are nowhere near it. We are below Fast start Finance targets too. The reason why we want clarity on the flow of finance is because of these inaccuracies – there is no clarity as to how these goals will be reached. Moreover, it raises a question on the credibility of our commitments and the sincerity of the whole exercise. Thirdly, the primacy of Public resources is very important in this scheme of things. For instance, do we expect private investment for Adaptation, which is a dire need of the developing countries? Where is the data? It does not happen in my country and I have heard this from many colleagues of developing countries also that private sector does not come forward for investment in Adaptation. Therefore, Public resources will have to address these concerns. Where is the mention of leveraging, or creating conditions in the developing countries in the decision texts? Private sector in my country also makes investments – do we count it as international climate change assistance, or flows? On the question of IPR, the suggestion is not to dismantle the regime, but to make climate-friendly technologies available to the developing countries at affordable costs by paying the costs through GCF. Every Climate Action has a cost and the world must think, who would pay the cost. Instead of making the polluters to pay, we should not end up with a formula where we make the poor pay. The principles of Equity & CBDR are the core principles of UNFCCC. It permeates all the provisions, commitments, actions, role and responsibilities under the 1992 Convention. During negotiations, it has been agreed that the new agreement will be under the Convention. Therefore, all the principles and provisions of the Convention should apply to the new architecture of 2015 Agreement.